Ashley Reading chair of today. Her chair is over 2K – ours is $125.00. Chair is 33” wide x 36” tall x 31” deep. The chair was purchased in an antique shop in Toulumne County. 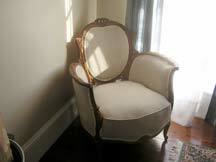 We need to ‘put back’ the closet we removed in the bedroom where this chair now resides, so the chair must go.